When I first viewed the Watsons Malaysia video for 2019 Chinese New Year, I just couldn't help smiling. It has that 1960's Shanghai vibe that I love! The video was launched by Ms Caryn Ong (Managing Director of Watsons Malaysia) during the Watsons Happy Beautiful Year Launch Party. 'Following the success of our previous #HappyBeautifulYear, we are proud to bring back #HappyBeautifulYear as part Watsons own tradition. This year, we welcome 2019 with a beautiful message of reconciliation and family togetherness. It's about putting aside our differences to celebrate Chinese New Year together. 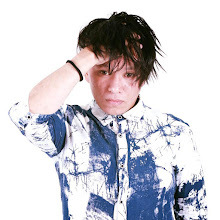 Watsons is proud to showcase the music video that is produced and directed with the most original, comic storyline with a charming song arrangement. We believe it will be one of Malaysia's favorite videos to watch this festive season,' said Ms Caryn Loh. Ms Caryn's prediction comes true as not even a week after it was launched, the video has been viewed for over 2.7 million times on Youtube! The celebrities appearing in this video include JinnyBoy, Amber Chia, Pink Tan, John Tan, Han Xiiao Aii, with cameo appearances by Watsons' own Malaysia's Top Influencers, Fasiha, Eva and Daniel, with Rubini Sambanthan, Eldison Lim and Gay Hau. I have watched it, with a smile on my face, a few times too! Let's watch it together here! 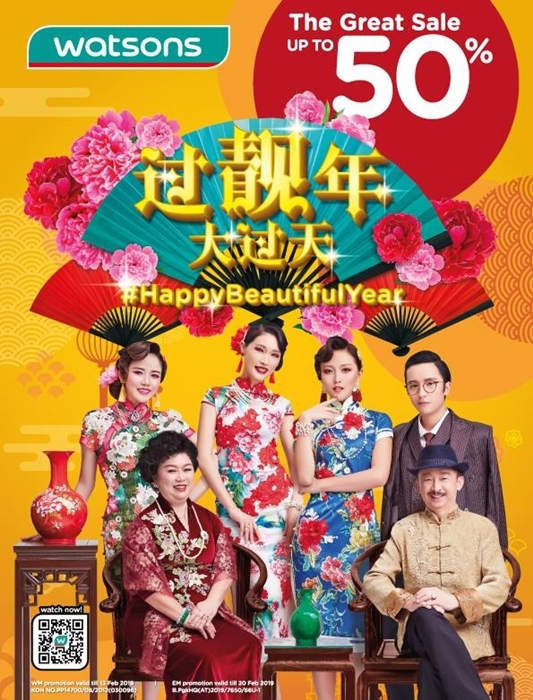 Watsons CNY 2019 - Happy Beautiful Year! 过靓年，大过天！ You are smiling too, right? Watching the video kinda reminds me of my own family. My siblings never fail to discuss (read: quarrel) over an issue and at times, as the eldest, I have to step in and stop the darting tongues before it hurts anyone's feelings. Then comes a family celebration, all those fightings were just water under the bridge. We will just hug each other, ask for forgiveness and be merry. And now comes the best part which is 'The Great Sale' by Watsons Malaysia, in conjunction with #HappyBeautifulYear campaign! Happening now across Watsons nationwide stores, everyone gets to enjoy up to 50% discounts on skin care, cosmetics, personal care, healthcare and many more. 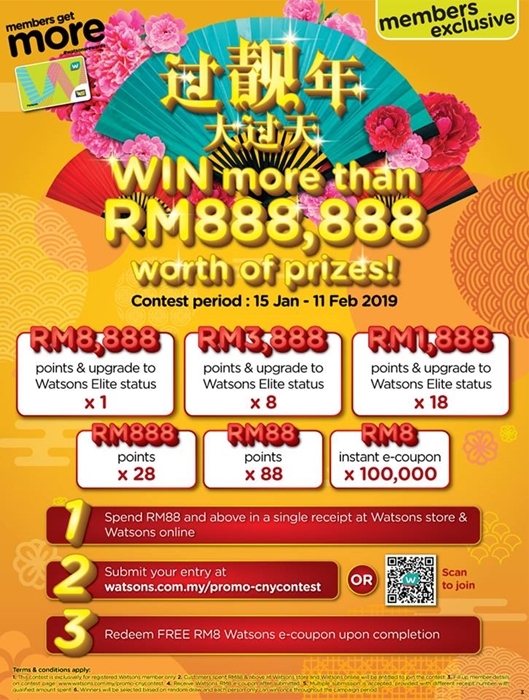 'Watsons members also stand a chance to win up to RM888, 888 worth of Watsons points when they spend RM88 at Watsons stores and online, and at the same time, earn 8 times the points when they pay with Boost.' Mr Danny Hoh, Customer Director of Watsons Malaysia added. 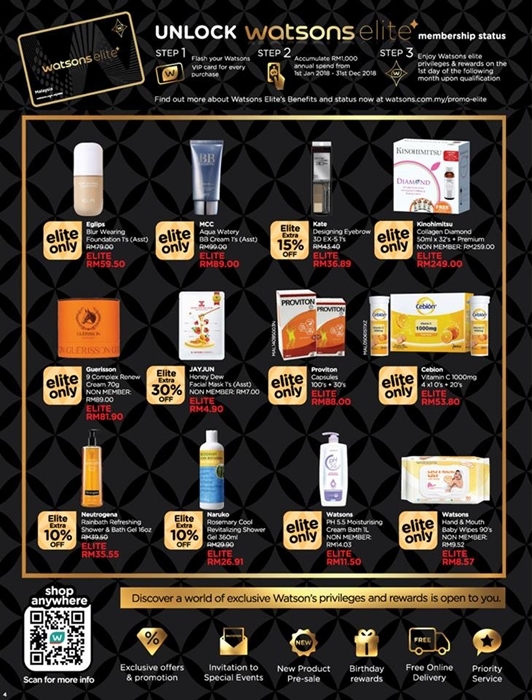 For Watsons Elite members only, spend RM188 and above to get free limited edition 6" Premium Gold Bowl. For the Pocotee & Friends lover, you'll be happy to know that the limited editions of Pocotee & Friends collectibles are up for grab with only RM20 and above of any participating product, which also entitles for PWP (purchase-with-Purchase). second daughter tu cute lah..siapa dia eh..mujurlah ada watson penyelamat mereka kan..wow di watson mcm2 ada 50% dan boleh menang RM888K..banyak tu.. I am a loyal customer of watson. Just unlocked my elite membership too. Can't wait to enjoy the benefits. adoiiiiii! 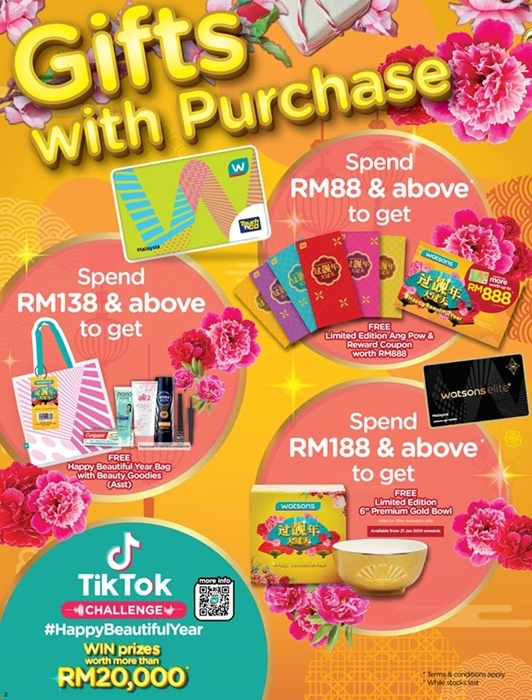 ni yang membuatkan nak shopping gila-gila kat watsons kalau gini la caranya, hadiah dia lumayannya,huwarrrr.... Okay video tu buat onie rindu dengan satu family even duduk dengan family pun sekarang. Good Job Watsons! Hadoi... Iklan nya lucu sekali. Seronok nonton. Amber chia lawa! Watsons memang tempat kita shopping keperluan. Sekarang ada banyak promo, opkos akan terjah Watsons! A fun, entertaining video about family. At the end of the day, blood is thicker than water...thanks to watson. LOL :D I have always shopped in Watson so gonna go there and try my luck now. I feel like watching the good old Chinese drama with the costumes and background and all hahaha. And that's a good one, too! A great video. Lots of fun i must say. Watson pun banyak sale sekarang. Suka betul nak membeli. Should I Do Intermittent Fasting?